One area often overlooked given it’s proximity to the likes of Shoreditch, the City and Clerkenwell is the bohemian paradise of Whitecross Street. In itself a thoroughfare leading from Old Street to the Barbican, it hosts a yearly festival of urban art and regular markets selling all sorts of tasty street food. The art and history of the area make Whitecross Street and the Barbican special places to visit. Walking round the area provides a real alternative to the often trod routes around Shoreditch and the St. Pauls area of the City which are nearby. It’s the sort of place that the locals know about but which doesn’t get talked about much on the tourist trail. 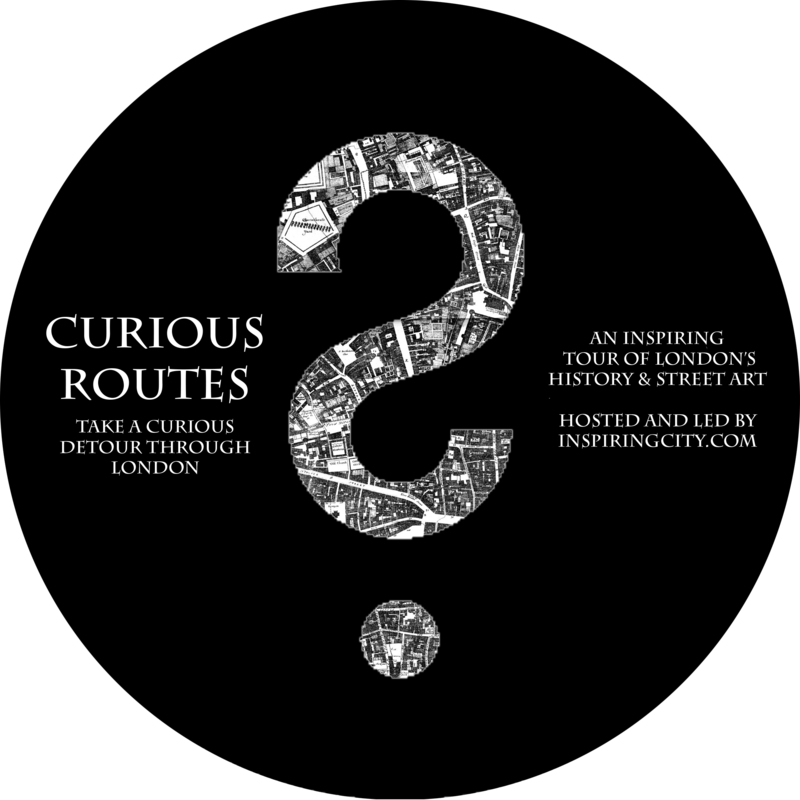 And so that’s why this Cultural and Historic walk of Whitecross Street and the Barbican is the first in a series of ‘Curious Walks’. A partnership between Inspiring City and the Curious Duke Gallery we will take in the art and history of the area with a coffee and cake along the way. From Old Street Station take exit 3 you will come out onto the Old Street roundabout, head down Old Street towards Barbican and walk until you come to St Lukes Church. You’ll pass the “Worth More” mural by Ben Eine on the right hand side of the road, a tribute to Tom Easton a young man who was stabbed to death nearby in 2006 and other victims of knife crime. Carry on just past the mural on the same side of the road and you will already probably have seen the unique obelisk spire of what was formerly St. Lukes Church. St. Lukes is now no longer a church at all having been deconsecrated in 1960. After falling into ruin, the grade 1 listed building was restored to it’s former glory to become a music centre operated by the London Symphony Orchestra, in fact the new name for the building is LSO St Lukes. The original church was built in 1733 and was designed by John James though some key features, including the obelisk spire were the work of Nicolas Hawksmoor. Feel free to have a look around the grounds, St. Lukes Gardens formerly part of the churchyard backs onto the church and looks towards the Ironmonger Row Baths, a former public bath house and Grade 2 listed building. Following renovations it reopened in 2012 as a community leisure facility which includes the restoration of the old Turkish bath area. From the entrance to LSO St Lukes on Old Street continue right along the road you’ll come to the Timberyard, a coffee shop and art exhibition space. The downstairs of the Timberyard is used to host art shows and exhibitions and it’s worth popping in to take a look to see what they’ve got on. Carry on along Old Street until you come to the major junction with Goswell Road. Cross the road and you’ll come to to boundary of the Golden Lane Estate guarded by one of the Dragon boundary markers indicating that you are about to enter the confines of the city. The Dragons are based on two much larger sculptures which were mounted above the entrance to the now demolished London Coal Exhange on Lower Thames Street. Those Dragons were chosen to be the model for the City of London’s boundary markers in 1964. The two original Dragons still exist having been relocated to Victoria Embankment. Continue down Goswell Road until you come to the boundary of the Barbican marked by an ancient stone frieze depicting the process of gold refining. The frieze used to stand in at the entrance to W Bryer & Sons at who were Gold Refiners and Assayers and was one of the few which survived heavy bombing when on the evening of 29 December 1940 the area suffered a terrible onslaught and great destruction to an area covering some 35 acres. Bryer & Sons was one of the few places which survived but in order to facilitate regeneration was demolished in 1962 with the frieze conserved. It was re-erected in it’s current position marking entry to the Barbican estate in 1975. Head into the Barbican estate along White Lyon Court. The Barbican is for some a brutalist masterpiece and for others a travesty of 1970’s town planning. One thing that cannot be in question is that today it is a unique area within the confines of the City of London. It has oasis’s of green, a World class arts centre, an ancient church, some sections of the old city wall and some of the most expensive real estate in London. Walking along White Lyon Court will take you up a ramp into the heart of the estate and from here you get a great view of the towers. To the right is a remnant of the Mendelssohn tree, the remains of a 500 year old Beech tree which fell during a storm in 1990. The tree, in Burnham Beeches Buckinghamshire, was where the composer Felix Mendelssohn used to sit for inspiration which according to the plaque nearby included some of the incidental music to ‘A Midsummer Nights Dream’. At this point in the walk the Barbican can be quite confusing so try and get your bearings, you need to head along the John Trundle Highwalk and then take a right and follow the Seddon Highwalk which follows a ramp downwards and slowly turns a corner eventually coming to a vista from which you can see some of the maturing gardens of the estate. The estate was given Grade 2 listed status in 2001 having been designated a site of special architectural interest on account of its scale, cohesion and the “ambition of the project” and to be fair, if you don’t know your way around it’s fairly easy to get lost. The gardens themselves are impressive, a great green lung in the middle of the brutalist buildings. You can’t go in unfortunately as they are for residents use only but they have matured impressively over time and are just an example of the way the Barbican Estate has skillfully cultivated it’s environment. Look beyond over the oak trees and you will be able to make our the tower form the church of St. Giles Cripplegate where we shall eventually be heading. Continue along the Seddon Highwalk following it around towards the direction of the Museum of London for which you will see many sign until you eventually come to John Wesley Highwalk. Take this new path and follow it along until you come to the Ironmongers Hall, a totally unexpected period building which finds itself hidden away in a nook of this giant estate. The Ironmongers are one of the twelve great livery companies of the City of London granted a charter of incorporation from Edward IV in 1463. The hall itself, despite it’s Tudor appearance, only dates from 1925 after the Ironmongers previous hall on Fenchurch Street was destroyed by a World War I bomb. In it’s new location it narrowly survived destruction during the Second World War after a German Air Raid destroyed all the surrounding buildings. It then fought off a compulsory purchase order in 1966 from the City Corporation who wanted to use the land for the new Museum of London. Eventually, once passed the Ironmongers Hall, the John Wesley Highwalk will lead straight out into the courtyard of the Museum of London which is one of the greatest Museums in the city. Totally free and showcasing the history of the city from mesolithic times to present day it is a tremendously important cultural centre. By all means spend as much time here as you like, it’s well worth it and at this point in the tour if you want to finish then the Barbican and St. Pauls tube stations are really nearby. If you want to carry on with the tour then continue straight towards an opening in the walls of the rotunda courtyard and over a footbridge which will take you across the road known as ‘London Wall’. Go down the escalators and you will be on Aldersgate, turn right and walk towards the Lord Raglan pub. 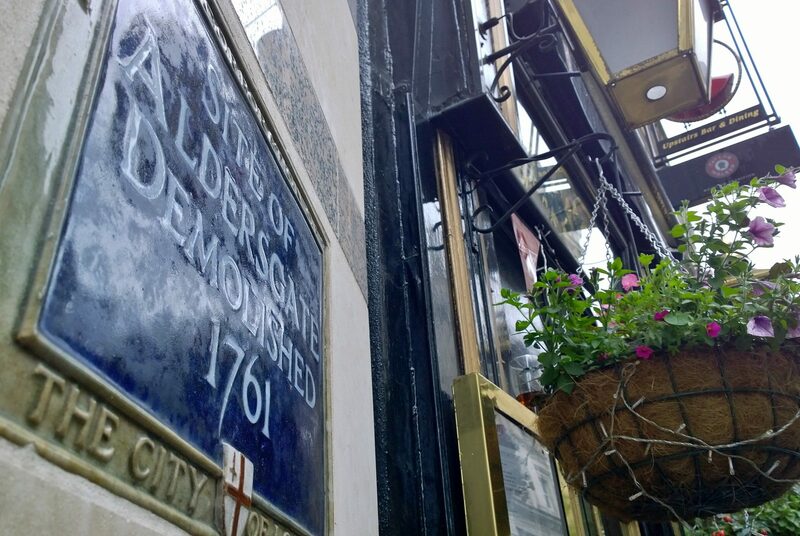 Stop outside and this is the approximate location of the Aldersgate itself, one of the seven gates of the old city of London. It replaced an older gate leading from the old Roman fort in around the 4th century and remained an important access route towards St. Bartholomews Priory, Smithfield Market and the London Charterhouse. The gate lasted until 1761 when it was demolished to make way for a road widening scheme. After the Lord Raglan Pub turn left along Gresham Street and then left again along Noble Street which runs almost parellel with Aldersgate. Here there are two key points of interest, the first St. Annes Lutheran Church was one of the churches which is mentioned in the Oranges and Lemons Nursery Rhyme with the line “kettles and pans say the bells of St. Annes”. It was destroyed in the Great Fire of London in 1666 but then rebuilt by Christopher Wren only to suffer another hit in the Second World War and have to be rebuilt again. The line from the song is thought to be reminisant of the local coppersmiths who worked in the area. Next to the church is some excellently preserved sections of the old Roman Fort. The Fort pre-dates the city wall and was built in around AD110 it was only around 90 years later that work began on a defensive wall around the city which would eventually stretch over 3 kilometres. 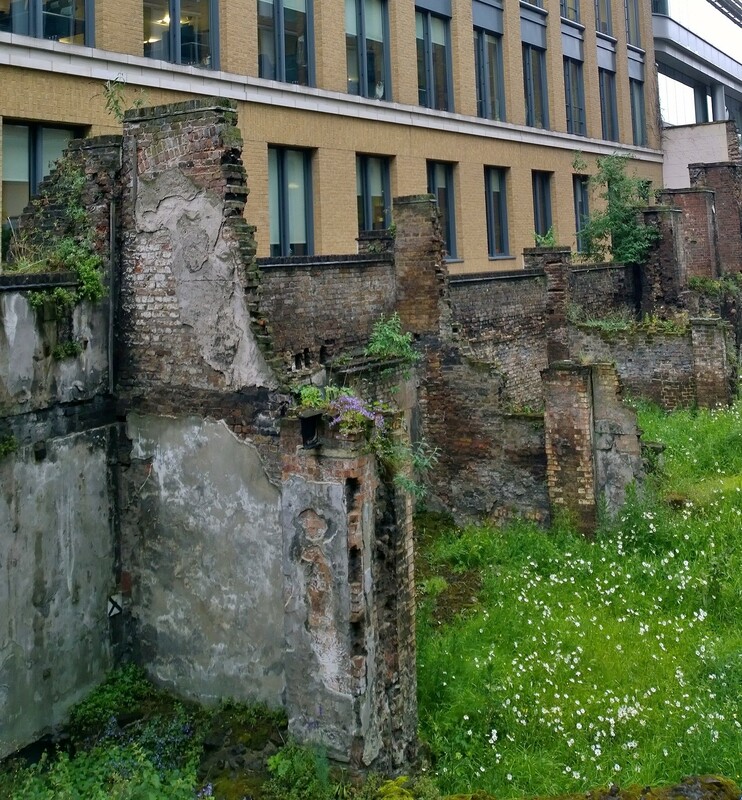 It was uncovered following the extensive re-development of the area that took place after the Second World War. Keep heading along Noble Street and you’ll come to the road known as ‘London Wall’, turn right and head towards the first crossing you see which is underneath an underpass on top of which a ‘Pizza Express’ proudly sits. Cross over the road and then head straight up Wood Street which is the road opposite. Here, if you wish you could take a small diversion to see some more sections of the old Roman Wall in St. Alphege Gardens which are particularly impressive. This tour though carries straight on up Wood Street and re-enters the Barbican estate by the ‘Wood Street Bar & Restaurant’. Turn left and you will see the imposing building of St. Giles Cripplegate which is on St. Giles Terrace. This area has lots to see, the church was damaged in the war but has since been restored and survived. It has seen many famous people buried there including John Milton and Martin Frobisher. 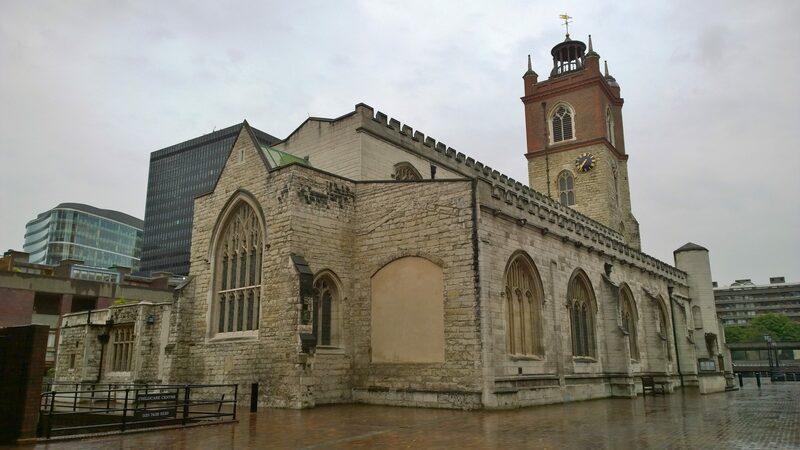 Oliver Cromwell was married here and Ben Jonson, Daniel Defoe and John Bunyan were baptised here, in short it is a building teeming with history. What’s more the line “brickbats and tiles say the bells of St. Giles” from the Oranges and Lemons nursery rhyme comes from here. If you can go into the church then do and if you can’t then still have a look around the perimeter. Here you can see more sections of the Roman Wall and an ornamental water feature which was once part of the city ditch on the outskirts of the wall. Don’t stray too far though because in order to get through the estate you will need to take the staircase nearest to where you entered up towards the ‘Barbican Highwalk’. Once on top of the stairs turn left along ‘The Postern’ towards the Barbican Centre which was opened in 1972 and which is now one of the premiere arts venues in the city. Don’t go into the centre but carry on along the path known as ‘Gilbert Bridge’ towards the ‘exit to Silk Street’. Be careful it’s kind of hidden from view so keep your eyes peeled but through a set of double doors a staircase will then lead you down onto Silk Street and through a reception area of the Barbican Center. Once on Silk Street turn left and head towards Whitecross Street, the entrance to which is opposite the Jugged Hare pub. Keep walking up until you reach the ‘Two Brewers’ which is on the corner with Fortune Street. It was here where the old Fortune Theatre once would have stood built in 1600 by Phillip Henslowe, Edward Alleyn and Peter Street, the man who built the Globe, after they decided to up sticks and move north of the river from the Southbank after the newly built Globe put a dent into the old Rose Theatres propects. It burnt down in 1621 but was then rebuilt until it closed down at the outbreak of the English Civil War in 1642. Keep heading straight up Whitecross Street and head towards the Curious Duke Gallery which sits on the corner with Banner Street. The Gallery often features in this blog and plays host to exhibitions from some of the best up and coming urban artists around and is a good place to pop in. The name Whitecross Street harks back to it’s time as a track leading from Cripplegate to Islington. It is thought that the track followed a watercourse and next to a stone arch leading over it, a white cross had been erected around 1000AD after that the area developed. The street itself is now probably best known for it’s market which also has it’s roots back in medieval times. Just outside the walls of the City of London, it was also outside of the City of London’s rules governing trade and as such it was unregulated and quite possibly chaotic, the street would have evolved due to it’s location between the city and the track to Islington. I love walking the streets of London even if they are not paved in gold! !… I hope you do many more of these and I must try to follow them… I know they require a lot of research in getting them down on paper!!! Nice one Stuart..
My old stomping ground when I lived near Goswell road from ’95-’06 – brought to life again reading this. I’m back in London this November and I look forward to doing this walk with new eyes., Thank you.